Coldingham Loch Fly Fishery & Holiday Cottages is under new ownership & management from October 2011. The holiday accommodation is set on a 60 acre site, centred around Coldingham Loch, a beautiful natural spring fed 22 acre loch which offers superb fly fishing for brown, blue and rainbow trout. Coldingham Loch is situated in a stunning coastal location a few hundred metres from the highest cliffs on the South East coast of Scotland. There are magnificent walks along the coast from here, and just above the loch towards the cliffs are the remains of an Iron Age fort with stunning views to be enjoyed from every direction. Coldingham Bay, a beautiful sandy beach is just 2 miles away & a great place for surfing, swimming & exploring the rock pools. Sea fishing and boat trips operate from nearby Eyemouth and St Abbs which is also a very popular and well known scuba diving centre. There are two stone built cottages including an unusual Victorian boathouse, Lochside Cottage, which comes with its own boat stored underneath the cottage. The new owners have re furbished this property to provide a unique 'get away from it all' cottage for guests to enjoy the beauty of this fantastic loch and picturesque scenery from their own balcony and garden. As well as the stone cottages there are a number of cedarwood timber chalets offering very comfortable accommodation at a reasonable price. 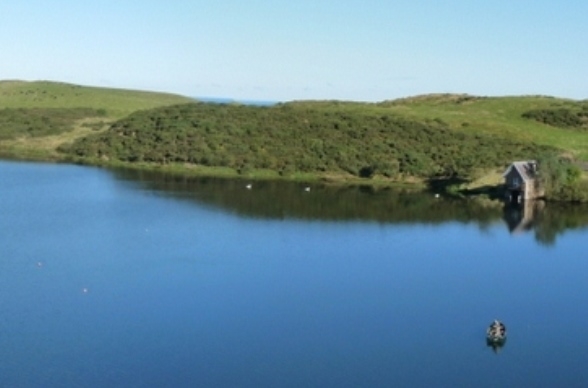 Coldingham Loch is a natural spring fed 22 acre loch set in approx 60 acres of land & the holiday cottages are scattered around the site. It is a SSSI site as it is the only Eutrophoc loch (naturally nutrient rich loch) in the Scottish Borders. Also the SSSI status cites its location so close to the sea as being a rare feature in eastern lowland Britain, giving the loch unusual chemical and biological features. The loch supports a representative range of vascular plant species, including the rare slender-leaved pondweed Potamogeton filiformis. Two locally rare species of dragonfly have been recorded at the loch, and in the water there are land-locked distinct morphotypes of stickleback. The SSSI reference also says that the site is locally important for a wide range of wintering wildfowl, geese and waders including long-tailed duck, whooper swan, widgeon, pink-footed and greylag geese. Plenty of other wildlife can be enjoyed around the site a wide variety of birdlife as well as roe deer, otter, badgers, hares, pheasants and partridge. There are plenty of walks from the Loch -the Berwickshire coastal path is about 200m walk behind Lochside cottage where the highest cliffs can be seen in all their glory - it is a fabulous spot & of course plenty of walks in either direction along the coastal path. St Abbs is the next village south along the coastal path & is very popular amongst scuba divers, so there are boat trips out from there for diving fishing etc it also & has a lighthouse with nature reserve. Another 15/20 mins walk along from St Abbs & you come to Coldingham Bay (or 5 minutes by car through Coldingham village) Its a lovely beach, good sand & surfing & lots of rock pools to explore. Locals also fish off the rocks here for sea bass and mackerel. Local shop & 2 pubs in Coldingham 1.5 miles, next place is Eyemouth small harbour town 4/5 miles (great fish & chips on the harbour), 12 miles (but only 15 mins in car down A1 ) is historic Berwick on Tweed, with a really good arts/culture centre called The Maltings for music/theatre etc. Edinburgh only an hour away by car - or you can go by train from Berwick Eyemouth Golf clubs provides a spectacular links course right on the cliffs. Lochside Cottage – updated for 2012 season, this unique victorian boathouse is set over the loch so comes with its own boat, Its in a beautiful spot & quite unique. It is cosy (central heating has been nstalled as part of the upgrade), sleeps 4, one double room and one single room with a pull out mattress under the single bed (or the forth person can sleep on the sofa bed in the lounge). Open plan kitchen & lounge with a woodburning stove & balcony over the loch. Outside is a small decking area for eating & enjoying the view to the side of the cottage across the loch. Cedarwoood chalets – are fitted out like static / mobile homes and all are comfortable and warm with shower rooms. Sunnyside was refurbished winter 2011.